A few months ago my husband and I were walking at a park in with the kids and some friends. We came across a little boy riding a bike with his dad walking along side him pushing a stroller. Very typical accept we noticed this little toddler’s bike had no peddles. He had on his helmet, his elbow guards, knee Guards and was moving along with this bike……with no peddles. He was just kind of scooting along. At first when I saw it, I thought, “That is a bit strange”. But, my husband quickly pointed out that this bike was to help him balance. So instead of training wheels, which I am not against for the record, to give you the illusion or feeling of riding a bike, you learn first to balance and divide your weight properly. However, I know many of you remember what it felt like to ride without the training wheels….it was not as easy as you thought it would be, right. To go from feeling completely in control, which was only an illusion, until reality set in when they where removed, and you felt like someone ripped the rug from up under you. I scrapped my knee, my elbows and perhaps some other places. So, the idea of getting Gabe, my 5 yr old, and Angel, my 4 yr old, these gliders, actually began to make sense. But, I wasn’t still sure about the process. My husband ordered the bikes and the first one that arrived was Gabe’s. 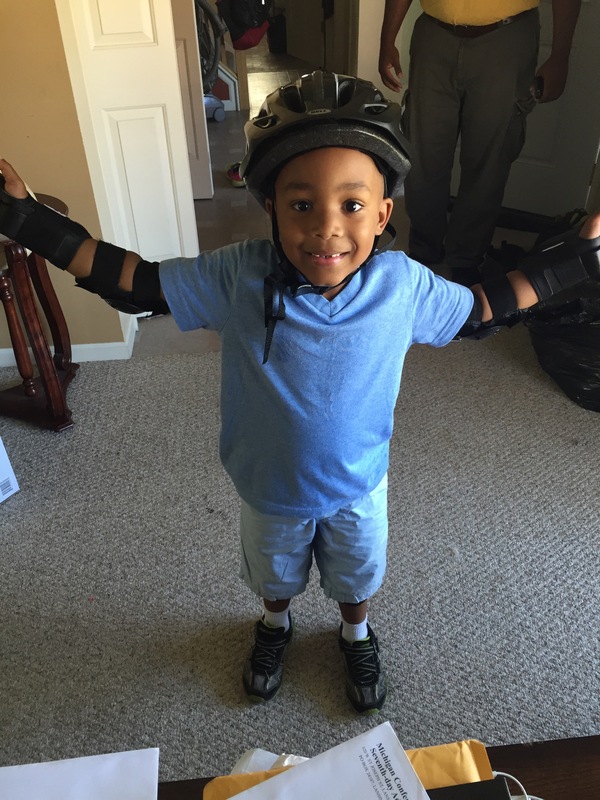 My hubby got him a helmet, knee and elbow guards, and even hand guard with wrist protection. This guy was ready too……scoot….walk ride…..slide along??? I really wasn’t sure, but either way he would be safe doing it with all that gear. So that means there will be some sticky situations and troubles along the way, and even some falls, but the Armor Protects you from those things taking you out. Gabe had some challenges while learning to ride this bike, Balance was one of the major ones, which we will talk more about later. But for now, be sure to get suited up for what life will bring your way. God is the only one who can protect us from these things and we don’t want to take that ride without him! Be blessed and remember you are Covered and Loved!